UNICEF's Masquerade Ball, the highly anticipated Halloween fundraiser exclusively held in New York and Los Angeles, will debut at Chicago’s Moonlight Studios on October 30th. Hosted by UNICEF Next Generation members, the funds raised from the Ball will help educate the more than three million displaced children in Syria. 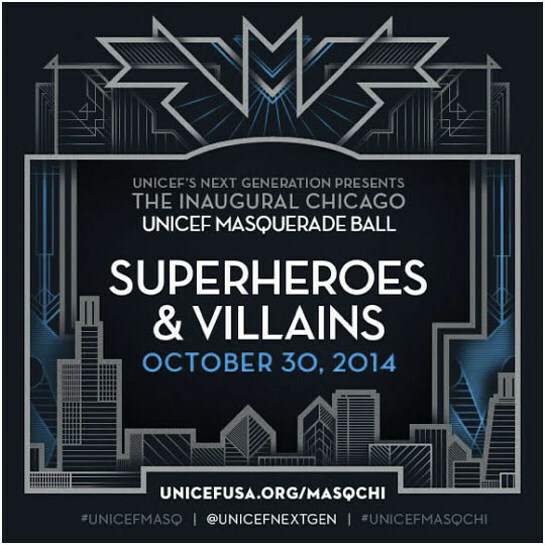 “We’re incredibly proud to host our inaugural UNICEF Masquerade Ball in Chicago. We know the young people of Chicago are going to embrace this opportunity to enjoy a great Halloween party, while raising funds for such a critical cause,” said Erin Guffey, Next Generation Chicago Vice-Chair and event Co-Chair. With the theme of Superheroes & Villains, the star-studded Halloween event will feature attendees in themed costumes, music and dancing, an open bar, organic catering, a candy bar, and a zero waste initiative. Event supporters include Hershey’s, Hub 51, Pure Kitchen Catering, Vita Coco, and Aqua Hydrate Water, with gift bag items donated by Giorgio Armani Fragrances. Previous UNICEF Masquerade Balls in Los Angeles and New York have been supported and attended by celebrities and philanthropists including Olivia Wilde, Jason Sudeikis, Zooey Deschanel, Ahna O’Reilly, Lindsay Ellingson, Jenna Bush Hager and Barbara Bush. Funds raised by the Next Generation group for the Syria: No Lost Generation Project will be matched by the Education Above All Foundation, up to $10 million dollars. “We know that access to education is pivotal in ensuring that all children reach their full potential and we’re committed to making sure that the Syrian children are not forgotten and to helping them retain normalcy amidst community upheaval, isolation, and armed conflict,” said Guffey.